Award-winning Creamline Dairies, the proud Principal Partner of Royal Cheshire County Show’s Main Ring, is prepping a treat for the taste buds at this year’s show. To celebrate the launch of its new fruit and vegetable online home delivery service, Creamline has teamed up with a duo of select celebrity chefs. One of these chefs, Nigel Brown, will again be making a guest appearance at the Creamline Stand, C5 Stands 44 and 45 on June 21 and 22. Nigel has produced a series of recipe masterclass clips for the online home delivery service, using all their lovely, market fresh produce. Take a look at the mouth watering vegetable curry and hearty casserole featured at www.creamline.co.uk. 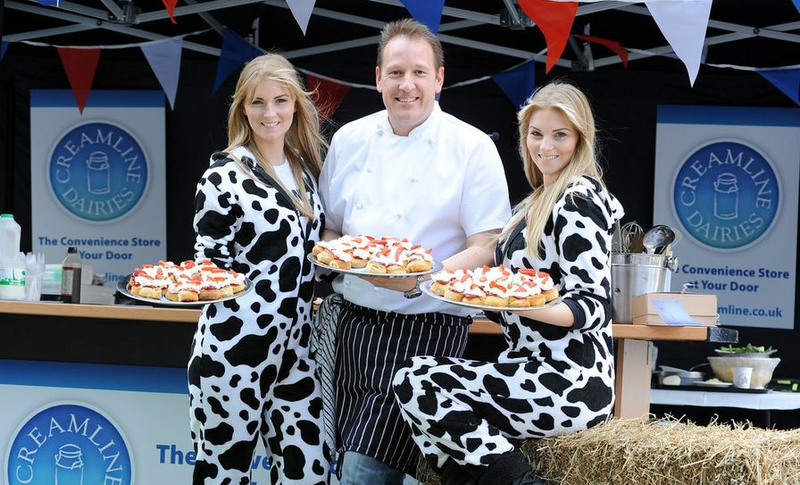 Nigel will be wowing the crowd with new recipes at the Royal Cheshire County Show and he will be on hand to answer any cookery questions from visitors to the Creamline stand. There will also treats on offer – last year saw Nigel whipping up some delicious smoothies to cool the crowd. If you can’t wait until June 21 and 22 for more cooking inspiration, head to Creamline’s new sweet treat recipes, which have been developed for the home delivery company, by Great British Bake Off’s Luis Troyano. With delights including fruity Eccles cakes and chocolate and vanilla macaroons, Creamline has afternoon tea covered!